For the past few TV seasons, reviewing Panasonic's high-end plasma TVs has felt more or less like a coronation. They've just been so consistently far ahead of the plasma competition that we've had little choice but to love them. This year, though, we're not automatically wheeling out a crown to greet the Panasonic TX-P50VT65. First because Samsung has already put forward a big challenge with its outstanding PS64F8500, and second because the Viera TX-P50VT65 ships with a stupid electronic touch pen. More on this scarily pointless feature later. Thankfully the Panasonic TX-P50VT65 also has some rather more promising features up its sleeve. For instance, it uses a new panel design dubbed NeoPlasma Black 3000. This delivers an unprecedented '3000Hz' effect chiefly by boosting the efficacy of Panasonic's sub-field drive technology. Panasonic's high-end plasma TV also claims to deliver a step up over the performance of its cheaper GT60 series sibling by using a higher-grade filter in its screen, to reduce the impact of ambient light on its potentially spectacular contrast performance. The Panasonic TX-P50VT65 additionally carries Panasonic's new and rather lovable My Home Screen smart TV interface, and plenty of multimedia support. But history suggests that it should be the Panasonic TX-P50VT65's picture quality that proves its star attraction. The Panasonic TX-P50VT65 is priced at £1,799 (around US$2,711/AU$2,810). 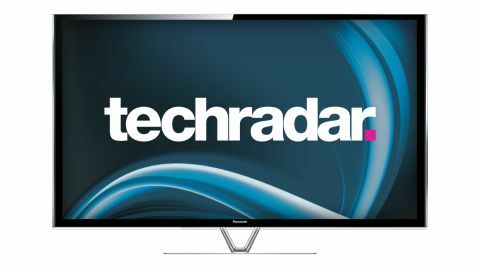 If you like the idea of the Panasonic TX-P50VT65 by the time you reach the end of our review but would like something bigger, Panasonic does 55-inch (£2,399) and 65-inch (£3,499) VT65 series models too. Or if you want something cheaper at a slightly reduced performance, the Panasonic GT60 range should do the job. Where rivals are concerned, the Samsung F8500 plasma series is definitely the closest competition, thanks to some unprecedentedly bright (by plasma standards) pictures and a very powerful and sophisticated smart TV system. Also of interest, though, should be the Sony KDL-55W905A, which offers the richest colours and best black levels yet seen from an LCD TV. With design now a key part of many households' TV buying decisions, the Panasonic TX-P50VT65 suffers a little versus much of the competition by virtue of its frame being markedly wider than those of most LCD televisions. That said, its silvery metallic stand and open 'V'-style stand neck look cute, and the finish of its frame is polished enough to almost turn its size into an advantage. We also welcomed the discovery of a pop-up camera in the centre of the TV's top edge, since this enables you to video call friends over Skype without needing to buy an optional external camera. This camera also enables the TV to recognise who's using the TV, for automatic selection of individual users' preferred home screens (more on this in the Usability section). The Panasonic TX-P50VT65's rear delivers an initial slight disappointment since it turns out it only carries three HDMIs when most mid and high-end TVs now carry four. Everything else is present and correct, though, including three USBs for multimedia (video, music and photo) playback and recording from the set's Freeview and Freesat tuner, plus built-in Wi-Fi and wired LAN options for streaming in multimedia files from networked PCs or taking the TV online with Panasonic's Viera Connect service. This service is good rather than brilliant. There's a decently wide selection of content, with some surprisingly respectable games joining video, music and utility apps. Among the key video streaming services Viera Connect carries are Lovefilm, BBC iPlayer and BBC News/Sport. Also present is Acetrax, but this service is scheduled to be closed in June. Notable by their absence, though, are Netflix and UK catch-up services beyond BBC iPlayer, putting Viera Connect at a disadvantage to the latest smart TVs from Samsung, LG and Sony. Providing considerable solace for this shortage of top-level video services, though, is the inspired My Home Screen interface Panasonic has introduced this year to make it much easier for you and your family to find the content you each like the best. We suppose we're duty bound to talk a bit more about the Panasonic TX-P50VT65's touch pen functionality, whether we want to or not. The deal is that a quite tactile and attractive white pen provided free with the TV can be used to interact directly with the TV's screen, for drawing, writing notes or playing games. To be fair to the touch pen feature, the functionality provided by the TV's software makes it more flexible than you might expect, and the screen responds quite accurately and effectively to the pen's touches. But we ultimately can think of no truly compelling reason why we'd want to put down our tablet computers or phones, stand up from our comfy sofas, walk over to our posh new TV and start tapping and scraping away on its surface with a big pen. Even drawing a false moustache and devil horns on Katherine Jenkins failed to give the feature any appeal. And if that won't do it, nothing will. Having mentioned tablets and phones back there, let's discuss Panasonic's new Viera Remote 2 app for Android and iOS devices. This is one of the best of this generation's TV remote apps, providing in one easy-to-follow piece of software the means to control your TV via your smart device's touchscreen display, share multimedia from your smart device with the TV screen and share what's showing on your TV with the screen of your smart device. And the Viera app isn't the only alternative control system on offer with the Panasonic TX-P50VT65, either. The TV also ships with a second remote control with a streamlined button count and a built-in touchpad cursor control. The plasma panel at the heart of the Panasonic TX-P50VT65 features the now customary round of technical improvements by Panasonic's R&D department. The sub-field driving system has been boosted, for instance, to help the panel deliver an unprecedented '3000Hz' effect to boost colour brightness and motion fluidity. There's also been a further improvement to the filter built into the Panasonic TX-P50VT65's screen for soaking up ambient light, meaning there's less chance of extraneous light being able to infiltrate the plasma cells (thus reducing contrast) and less chance of reflections on the screen getting between you and your enjoyment of the Panasonic TX-P50VT65's hopefully gorgeous images. It's not just Panasonic's long history of delivering class-leading black levels from its plasma TVs and the improved screen filter that's raised our hopes of record-breaking black levels from the Panasonic TX-P50VT65, though. Also important should be the Panasonic TX-P50VT65's Infinite Black Ultra panel technology versus the slightly less contrast-rich Infinite Black Pro setup of the step-down GT60 series. The enhanced panel and processing in the Panasonic TX-P50VT65 delivers some colour benefits over the GT60 series one step lower in Panasonic's range. First it can deliver a claimed 30,720 gradation steps versus the cheaper model's 24,576 gradations. Even more tantalisingly for movie fans, though, it's capable of delivering a claimed 98% of the full colour range of the Digital Cinema Initiative (DCI) specification. In other words, it has the potential to deliver almost exactly the same colour scape you should see in a commercial cinema. The VT65 level of Panasonic's plasma range has traditionally been aimed squarely at serious AV enthusiasts, and this cycle isn't broken by the Panasonic TX-P50VT65. As well as the uncompromising panel design already discussed, the plasma TV comes boasting the endorsement of both the THX quality assurance group and the ISF professional calibration group. THX has backed up its endorsement with a specially calibrated picture preset on the TV, while the ISF endorsement results in two 'professional' presets and a huge array of picture tweaks including expansive colour and gamma management tools. In a particularly brilliant touch, you can even fine-tune the Panasonic TX-P50VT65's pictures via the Viera Remote app, so that you don't have to obscure the pictures you're calibrating on the TV with any on-screen menus. The last really significant feature of the Panasonic TX-P50VT65 to cover is its 3D playback. As with all plasma TVs, this is of the active variety, and we're happy to report that two pairs of active shutter glasses are included free with the TV.